“To be the thought leader in Industrial Engineering education and research, and partner in the manufacturing renaissance of the nation.”-This is the Vision of NITIE. “To advance transformative education and industry-inspired research in Industrial Engineering.”- This is the Mission of NITIE. We are NITIE. We are the Pioneers of the Industry. We are the Gods Own Campus with a lot of scenic beauty. We have our own NITIE Pond which is just majestic. 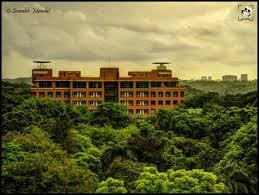 We have the tallest hostel building in India – Taylor Hall. And on top of that all – the Campus is Wi-fi Enabled. We have state of the art infrastructure to support the strong NITIE brand value. We have one of the biggest libraries across any B-School in India with a wide collection of books. Our alumni have made their presence felt all around the globe in every sector possible. From FMCG to IT, From BFSI to Sales, you name it and we have got it all covered. The faculty at NITIE has a strong educational background from various domains of the industry. Vastly experienced and intellectual people providing the right direction to the budding entrepreneurs and industrialists of the future. Best in Class Labs for research and an environment that promotes creativity is what defines this institution. The placements here are at par with the biggest B schools of the nation. Every student is trained across every sector and domain to be the leader in the market. Technology and sustainability walk hand in hand. The students not only become better professionals but also better humans. They incorporate moral values and are made to understand their contribution towards the society and environment. This is our NITIE. This is the God’s own campus. I would like to work for Aditya Birla Retail Limited (ABRL). I would like to be part of the operations process and would like to contribute towards the growth of the firm in the FMCG sector. I shall look forward to optimizing the ongoing processes in the supply chain and focus on reducing the manual dependencies so as to make the process more efficient and time-saving. I shall focus on technological advancement with an amalgamation of right human resources to increase the productivity and responsiveness of the entire supply chain of the MORE for better customer satisfaction.